LJHA is committed to the provision of a high quality of service to our customers. We welcome complaints, comments and compliments and we use customer feedback as an opportunity to learn about what we are doing well and where we need to improve. We appreciate there may be occasions where customers are dissatisfied with the level or type of service they have received, and wish to make a complaint. See below for a chart of how we deal with complaints, what we do not deal with as complaints and how you can submit a compliment or complaint. If you have decided that you are unsatisfied with LJHA, you can contact us via email, telephone, complaints form or visiting our reception. We will always try to resolve any problems at the first point of contact. If this does not solve the complaint, it will be progressed into an official complaint. 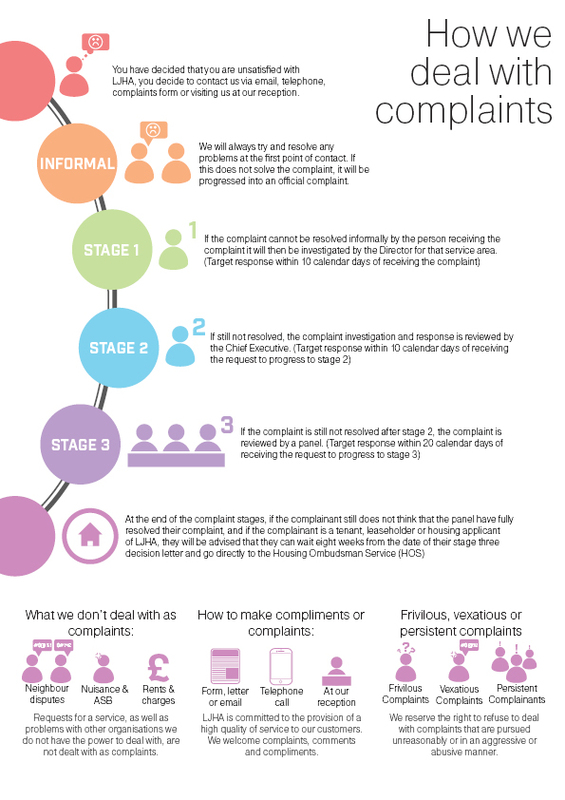 Stage One – If the complaint cannot be resolved informally by the person receiving the complaint it will then be investigated by the Director for that service area. The target response time for this stage is 10 calendar days of receiving the complaint. Stage Two – If it is still not resolved, the complaint investigation and response is reviewed by the Chief Executive. Target response for this stage is 10 calendar days of receiving the request to progress to stage two. 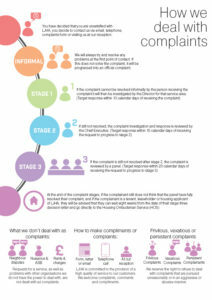 Stage three – If the complaint is still not resolved after stage two, the complaint is reviewed by a panel. The target response time for this stage is 20 calendar days of receiving the request to progress to stage three. At the end of the complaint stages, if the complainant still does not think that the panel have fully resolved their complaint, and if the complainant is a tenant, leaseholder or housing applicant of LJHA, they will be advised that they can wait eight weeks from the date of their stage three decision letter and go directly to the Housing Ombudsman Service (HOS). If you wish to make a compliment or complaint you can fill in the form below, call us on 0113 320 7777 or visit us at Stonegate Way, Queenshill Avenue, Leeds, LS17 6FD.